Sometimes, just sometimes, the Interwebs can be an amazing place. 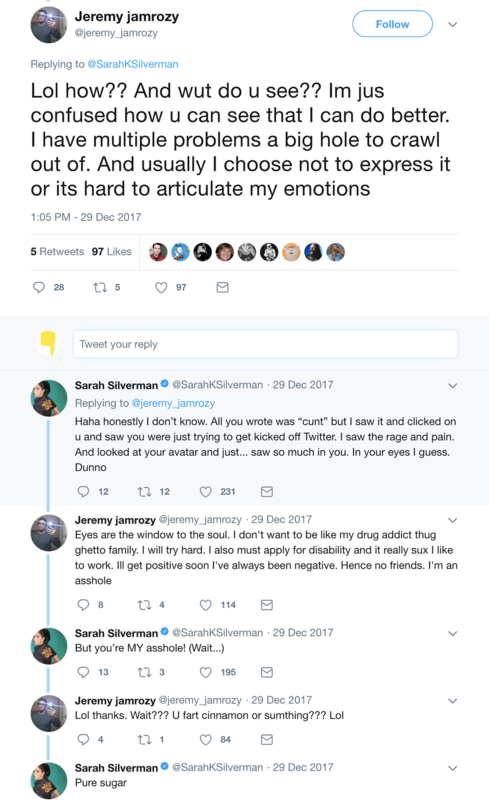 Twitter has always been a steaming pot of controversy, recently urged on by a certain President, but it’s this whole interaction between comedian Sarah Silverman and Jeremy that has peaked my interest. Bojan Dragić questioned her understanding which prompted a reply from Sarah, and then an abrupt reply from Jeremy ensued, seemingly from nowhere. What follows is an amazing exchange; an opening to understanding the heart & context of a person in their situation and practical love & kindness. Now this is the part that I can relate to; trust and being burned. Throughout my years I have given a lot, and that has taken it’s tolls. I don’t think that I’m one that expects much in return, i.e. it’s not a 1 for 1 exchange, but it would be nice to be on the receiving end every once in a while. When it doesn’t happen 9/10 times, you start to loose hope and trust in people. In my experience that has closed me off more and more. The burning hurts so much that it’s easier and safer to just be less trusting, less open, more anti-social. The patience, kindness and care that Sarah shows is pretty amazing. Something that most people don’t seem to have the time for in this day and age. All that from a four letter word to an amazing woman hey?